Liar Liar opening line: Luke scrambled through the open window and on to the narrow ledge outside. In the dead of night, three raging fires light up the city skies. It’s more than a tragic coincidence. For DI Helen Grace the flames announce the arrival of an evil she has never encountered before. Because this is no firestarter seeking sick thrills, but something more chilling: a series of careful, calculating acts of murder. 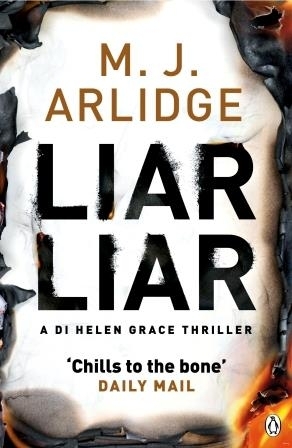 Detective Inspector Helen Grace has not one, not two, but three fires to contend with and three injured people. There is no distinct connection between the fires and to make matters worse the whole situation repeats itself the following night. But this time someone dies. The following night is then another fiery one and one more person dies. Helen and her team can find nothing to tie the fires together. Some are commercial properties, and the houses are all in different socio-economic areas. The most obvious suspect is a firefighter but if he didn’t start them who did? And while trying to solve these horrific crimes with more people dying, Helen has personal issues to deal with. Her lifestyle choices could signal the end of her career and her new boss is taking what seems to be an unhealthy interest in her. I’m always thrilled to read a DI Grace novel and this one did not disappoint. Dave and I are overseas in Europe. We will be back at work on the 19th of September. I will start replying to comments then. I won’t be able to read any blogs while we are away so please forgive my lack of visiting back. You can follow our trip by taking a look at our holiday blog. It has been a long time since I studied law but I can totally relate to how you feel. I’ve not read any DI Grace novels and this sounds like a good series.